If so, do you folks want me to keep this area of the forum around? I was asked by ACMCA to create this area of the forum but there has ben very little activity in it. i'm back as prez-dent, so i will see if i can drum up a little more support for your site dave...i just started looking at it and realize what a great resource it is...i was kind of out of the hobby for a while, but now i'm back, looking for a few machines. thanks to you for a great site! yes, we are still active. 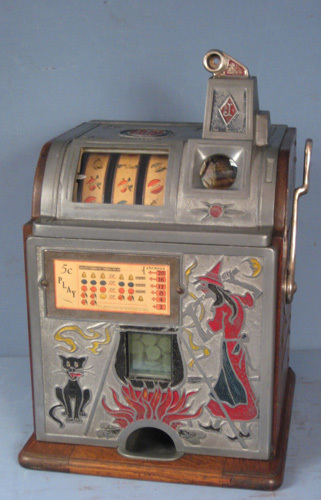 we are a group of so cal based coin operated machine collectors. we are a very diverse group ..some collect slots, some are more into gumball/peanut/vending stuff....others are into arcade.....we meet at a different member's house every quarter, so we can see each other's collections. it's a great way to make connections with others in the hobby....and you get FED more than the dues per year cost if you attend every meeting. we just voted to raise the dues to i THINK 35$/year. ACMCA is a very active club in Southern California promoting the preservation of coin operated devices. New members are always welcome. sorry goodguy, i just realized i didn't answer your question...antique coin machine collectors association.